Pandemic (2018. 701 pages) is the first in a new series of books penned by A. G. Riddle, who has previously authored the Atlantic Gene series. I think that this book is going to be very much a marmite experience for readers. Within its tome length, Riddle strings together multiple plot threads, which you just know, will all converge at some point. The book opens with the discovery of a lab on a crashed sub and the subsequent order for its destruction and the murder of all of the investigating team. Next chapter we are in Kenya, following which we are in Berlin. The book does a lot of jumping around and can be a little disorientating at points. The beginning of the book gives little away, in clues, as to what is actually happening. Even when you get to the half way mark you're still no further on. This then, depending on your tastes, will be either a great selling point or a complete turn off. The unravelling of the mystery is peeled back achingly slowly. Small spurts of action are interspersed with data dumps, flashbacks to characters past experiences and lots of dialogue about the pandemic. 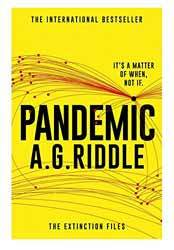 Oddly though, as the book stays with the main characters the effects of the pandemic on the world is largely pushed to the background. This is mainly dealt with placing the number of dead and infected at certain positions between chapters. On the other hand, if you like mysteries, in the Dan Brown style, providing various layers of multiple conspiracies’, then Riddle meticulously plots out just how many breadcrumbs and clues you’re going to get, enough for you to want to complete the novel. On top of the clues Riddle peppers the book with lots of technical information, this does slow the pace down, but its inclusion is there to support the pseudo veracity of the plot. Most of the mystery revolves around Desmond and his missing memories. Waking up next to a dead guy leaves open the possibility that we are not following the good guy here, but the villain. Only time and the return of his memories answers that question. I thought the flashbacks to Desmond’s childhood and adolescence, slowed the plot considerably without adding much to the current story. Frankly, I didn’t really care what life was like for him growing up; I just wanted him to get back some more pertinent memories so we could advance the plot. What you end up with is that the story is less interested in the end of the world apocalypse and devoted to the mystery elements. Overall, the plot could have been told in about half the pages, but then the central mystery would have been severely compromised.